First off, Jordan, thank you very much for your time! Can you take a minute to introduce yourself for anyone who might not know? Not a problem, Ben, thanks for having me. Jordan Ferguson, thirtysomething, freelance writer originally from Windsor, Ontario, Canada, based in Toronto since 2006. Are you a full-time writer? What are you currently working on? I’m envious of anyone who can consider themselves a “full-time writer,”[laughs]. I still work the day job, or night job in my case. I have a handful of pitches I’m still working up the nerve to send out, some short stories with the same problem, and a rejected comic script I’ve decided to just write anyway and see if a friend still wants to draw it. I also write semi-regularly on pop culture for The Same Page and on whatever doesn’t fit anywhere else on my site Poetry for Gravediggers. Can you lead me through your writing process? I think, as with most writers, I have a fair bit of impostor syndrome, and am worried about being outed as a fraud at any minute, so I’m a bit of a research junkie. Whatever topic it is I’m writing on, I spend an inordinate amount of time learning as much as I can about it. Usually, researching the main topic will provide something else I think I should know more about, so I spend an afternoon reading about that. It’s a vicious cycle, and one that can be difficult to step away from and just do the actual work of writing. If I have any sort of ritual, it only occurs to me as I’m thinking of it now: I talk to myself. A lot. I live alone, so whatever project I’m working on usually starts with me talking out loud to myself about the angle of the piece and the points I’m trying to make. While doing the dishes, brushing my teeth, in the shower. I’m sure it would drive another person nuts. I don’t have a set space to write. I prefer not to write at home, since there are too many distractions and I’m prone to panic-napping. I also like the surrounding bustle and background noise of a coffee shop or library. Plus, if you’re not a full time writer, it forces you to treat it like a job: wake up early, get dressed, commute somewhere in a timely fashion, etc. Most of Donuts was written at the Gladstone Library in Toronto, at my parents’ kitchen table in small town Amherstburg, Ontario, and at the wall mounted, foldout table in my apartment. Whatever the location, coffee is a must. I’m getting older; I’m trying to eliminate its necessity, but thus far failing. What were some things you preferred about writing a book than prior mediums? Disliked? I discovered early on that writing was the thing I was best at. I was always writing short stories when I was younger, which transitioned to bad poetry and monologues in high school. I got a Bachelor’s in English because it seemed like the thing to do, but lacked direction so I putzed around working in my hometown for a few years before I decided to go back to school for journalism, which seemed like a more lucrative avenue for someone who fancied himself a writer. I worked as a reporter and editor for a community newspaper in Windsor for a few years before relocating to Toronto and thinking I would transition back to fiction, but never finished anything that satisfied my personal levels of perfectionism. I pitched to 33 1/3 not entirely on a whim, but definitely at the last minute, and was as surprised as anyone when they bought it. The most enjoyable part is what it’s always been, just the act of writing. Like Dorothy Parker said, “I hate writing, I love having written.” It can take me a while to warm up, but every time I put in an afternoon of work on something, no matter how happy I might be with the result, I’m never conscious of the time or the hours put in. It’s the surefire sign you’re doing the thing you’re supposed to be doing. I probably need to remember that more. The biggest surprise? Canadian banks will hold funds on American royalty cheques for over a month. Not exactly a glamorous concern, but not a pleasant experience for anyone. What audience did you have in mind as you wrote Donuts? Has there been any evidence that it is indeed the audience that ended up reading it? I think one thing that worked to my benefit was early on I developed a clear understanding of whom the book was for before I wrote it. I wanted to dig a sort of path through the middle between the people who have a deep and dedicated knowledge of Dilla’s life and music, and people who maybe liked the album but didn’t know much about him or the circumstances surrounding its creation. It’s “entry level” by design. I never intended it to be the definitive piece on his life and work, and I don’t think it is. But I think I started a conversation, and as people continue to agree or take issue with my ideas, they’re still talking about Dilla, which is what mattered most to me. So far, it seems to have worked out that way, and I’ve received amazing feedback from people who were there and knew the man, so that’s all I need. You humbly called yourself a “nobody” prior to writing this book, in terms of writing experience. How have things changed? I’m now a nobody who wrote a book? [laughs]. I knew I could write, I’d been blogging and writing semi-professionally for over ten years when I got the book deal, but I didn’t have much of a resume, and still don’t. The book is a hell of a bullet point to have, and it’s won me some amazing opportunities I would never have had without it, but you’re only as good as your last hit, as they say. Most of my work in the last year has been from people coming to me, so when I pitched that comic script, or have been introduced to editors by mutual acquaintances, I probably expected I’d just sail on through, but I didn’t. Pitching is an art, and still one I’m trying to perfect. None of this is to say I don’t appreciate how incredible it is that the book’s performed as well as it has, and that people around the world have read my words, but I’ve also never lost sight of the fact that, with the exception of maybe 30 copies bought by family and friends, no one bought that book because my name was on the cover, which is fine because that wasn’t the point. What are your favorite books out now from 33 1/3 and what are some albums that you think deserve a book written? I was a fan of the series long before I thought to try and write one, and continue to be. Everyone acknowledges at this point that Carl Wilson’s book on Celine Dion was a game changer, and kicked the doors open for what these books could be. I’m also partial to the books about albums that mean the most to me, like Eliot Wilder’s book on DJ Shadow or Christopher Weingarten’s book about Public Enemy. As for what’s still out there, I know it’s been proposed a few times, but it seems tragic to me that no one’s ever successfully pitched a volume on De La Soul is Dead. That album built worlds in ways nothing has before or since, and it just seems so rich a text to dive into. It’s like the metatextual, self-aware, rap version of Pink Floyd’s The Wall. On your blog, you mention 33 1/3’s shift from Continuum to Bloomsbury Academic. Can you speak more about that shift in overseer? Furthermore, can you speak on the author’s relationship with their publisher? How do shifts in values of a publisher affect a book? I don’t know that it affected me that much, since I never intended to make my book very personal, but over the years the series developed a bit of a reputation for being more open to including the author’s individual relationship with an album. It’s the sort of passionate fandom that I’ve always responded to and appreciated, since it proves your bona fides to the reader, like, “Ah, this person clearly loves this record as much as I do, I am curious what they thought of it.” I don’t know that anyone pitching with a sample chapter that documented where and who they were the first time they heard the album would stand as good a chance, but I’m speculating here, there really aren’t any set rules. Honestly, I expected I would have a more hands-on relationship with my editor. I distinctly remember the first phone call I had with David Barker, who was the editor at the time, and telling him that I wasn’t going to vanish for ten months and then email a draft on my due date, but that’s pretty much what I did [laughs]. When David was succeeded by Ally-Jane Grossan, I didn’t correspond with her much either, apart from maybe one detail about sourcing a quote. I was just so focused on getting the thing in on time. I was surprised by how the push-and-pull of the relationship between the company and I changed: when I started, I viewed myself as an employee, contracted to finish a task, but as the book neared publication and release, the roles somewhat reversed, or at least began to run parallel, as we all wanted to see the project do as well as it could, and had to work together to that end. In a lot of creative industries, artists are no longer able to be just artists anymore. They have to be the artists, manager, agent, marketing, etc.. Have you found that to be in true in the literary world as well? Absolutely. Unless a publisher knows out of the gate they can rely on you to sell, the hustle stays on the author. Major publishing is shrinking just like anything else, and any extra hands in the office have to be available to the marquee acts. I was fortunate in that 33 1/3 always had great people backing me up, and sometimes an interview request came through the office, but the bulk of the work was left up to me. The success or failure of the project can come down to how much you want to put yourself out there on social media and engage with the people reading your book, which can be difficult since self-promotion isn’t always a writer’s primary strength; we tend to be happier alone at the computer. But it’s how the game is played today, for good or bad. Since my submission period in 2012, anyone drafting a proposal for a 33 1/3 has to include a piece on marketing and promotion. It’s not going to make or break your chances, but demonstrating you know who your reader (customer) is can put a publisher’s mind more at ease about taking a chance on you. You said in an interview with Life+Times that the first time you heard Donuts, you didn’t even like it. Given how much you have come to love it, what sort of weight do you give to first impressions? That’s actually a great question. I think the current state of the culture makes it difficult, there’s such a premium placed on immediacy of response. You have to be first, right? That’s what’s become so important, so much value is placed on getting out of the gate early, scoring the first tweet, instagram video or thinkpiece about anything. It’s become a world of hot takes with little concern for how one’s opinion might evolve even after a second or third viewing, read or listen. The fate of entire projects can be hinge upon how a teaser trailer is received. Who knows how my professional career would have ended up if I’d gone into Donuts expecting to hear what I was already used to, and dismissed it forever? I probably wouldn’t have one to speak of. I think it’s more a problem with social media than it is with the professional industry of reviewing, but, to your question, I don’t think first impressions can be totally trusted. Give your opinion the time it deserves. This interview is not about just Donuts but rather about being an author. That being said, I wanted to give you a space to speak on Donuts if there is something you think that my readers should know. Love it or hate it, whatever music you’re into, I think everyone should hear Donuts at least once. Part of what always and still fascinates me about it is the snapshot it takes of an artist in decline. While the “made on his deathbed” story regarding its creation has become pretty apocryphal over the years, it is absolutely true that J Dilla was always working, up until the day he passed, because to him it wasn’t work. He just refused to live his life without music, he loved it that much. We should all be so lucky to find something that fulfills us that much, and make a living from it when we do. 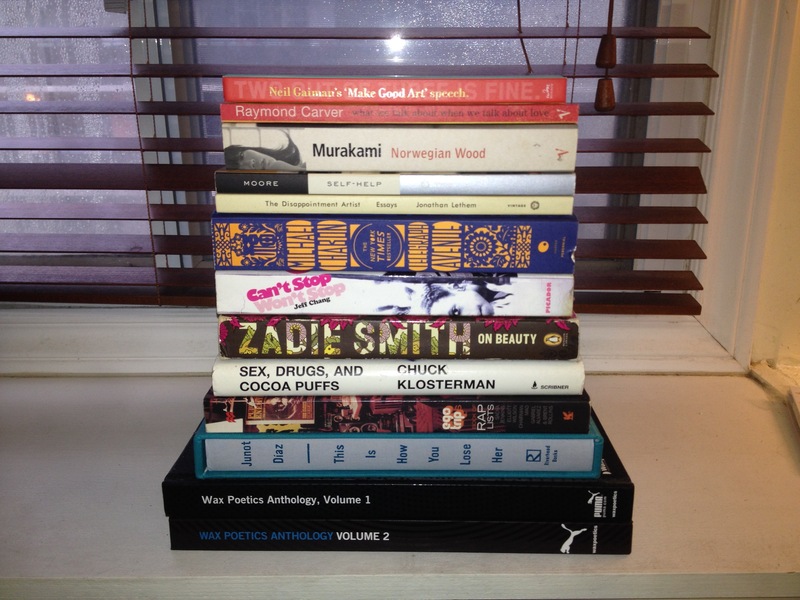 Now that you are a part of the Shelfie Generation, can you take a shelfie? What are these books? Thank you so much for your time! Any last words? No problem! It was a pleasure. If you’re a reader, thank you. If you’re an editor, email me. [laughs]. And if you’re aspiring, the most important things you can do are to finish, and to put your work out there, however you choose to do so. Remaining an undiscovered genius can be comforting, I know, but it only leads to unhappiness. Figure out your lane, and run it as hard as you can. 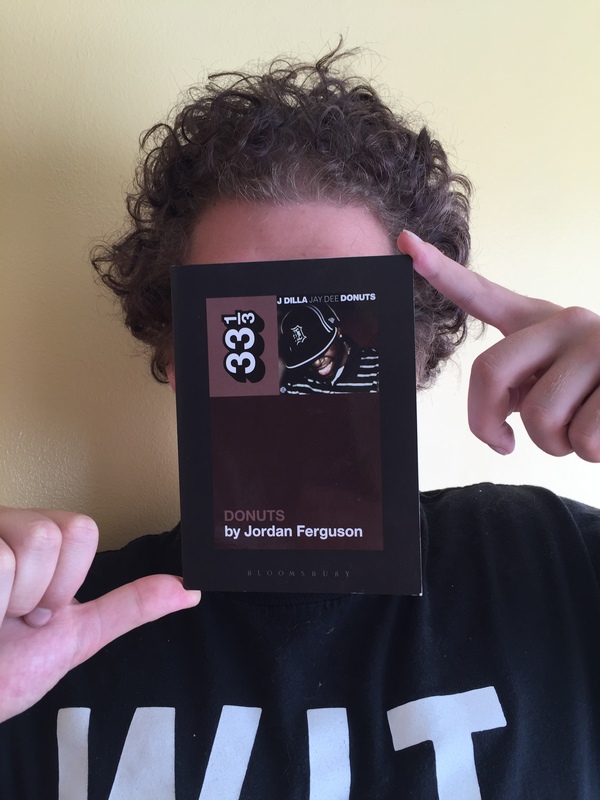 I can be found online at Poetry for Gravediggers; I’m on most social networks @jordan_ferguson. Editor’s Note: If you made it this far, you have been rewarded with a youtube stream of Dilla’s Donuts.